This high-sensitivity, 12-parallel-channel, WAAS-enabled GPS receiver comes with an integrated magnetic base. The puck-like receiver is 2.4 inches in diameter and weighs just a few ounces, making it an ideal solution for applications where space is at a premium. 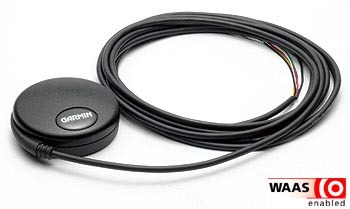 GPS 18x LVC has bare wire for connection to a variety of applications; can output data in NMEA 0183 format (industry standard) or proprietary Garmin format; provides a pulse-per-second logic-level output with a rising edge aligned to within 1 microsecond of UTC time.